Increase your sales from Instagram! NowLink allows you to direct your followers to your product page in your website, putting links on your Instagram photos. Easier for buyers, and more profitable for sellers! 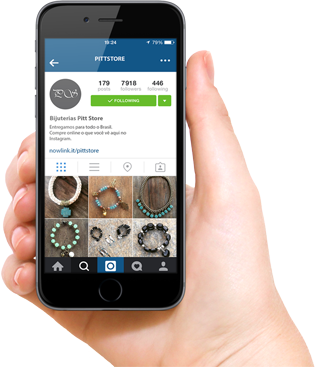 Now your customers go from Instagram directly to your product page on your site. More sales! Without the need of widgets or code integration. Insert links in your Instagram photos in a matter of seconds. NowLink keeps your brand ID. Whitout changing photos, colors or logo. Totally functional and friendly for Mobile, Tablet and Desktop. Do you want to promote more than one product? Using NowLink you can create many links on the same photo. You can post a complete look! Optimize purchases with a feel clicks. Your customers will have many reasons to buy. Your photos appear clickable and the customer access to products directly, easily finding the product to buy. With only one click your customer is ready to buy the product on your website. Easily and Fast. It´s possible to sell more. Contact us to discover how to get NowLink on your Instagram!